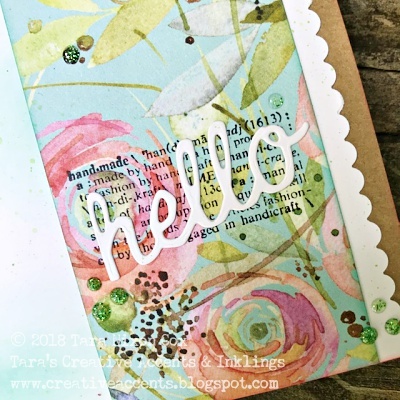 I trimmed a strip of the floral paper to fit a die cut 'hello' sentiment (from the Sizzix Side Order die set) I added a simple 'handmade' definition stamp in black (an OLD Hero Arts fave!) to help draw the eye to the die cut greeting. Such a pretty mug of tools! The little butterfly is also from the spring Side Order die set, I stamped the same definition on the back side of the patterned paper (which has a pale pink pattern). A little bit of Distress Ink blending (behind the paper piecing) and some Nuvo Glitter drops add a bit of extra interest to the background of my card. I also added a bit of splatter details using Dina's Scribble Sticks. They make it soooo easy! 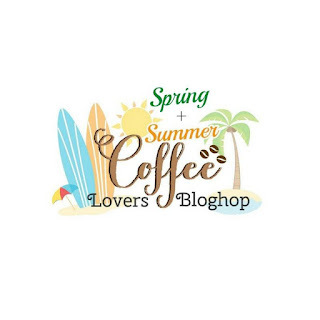 For more fabulous coffee related cards, check out the hundreds that have linked up at the Spring & Summer Coffee Lover's Blog hop! 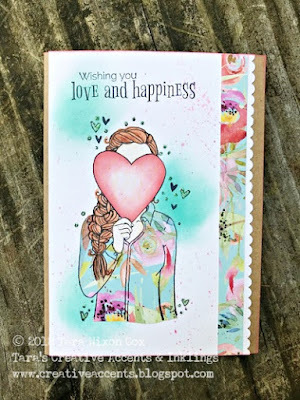 My second card features this pretty image & sentiment by Unity Stamps. I used both sides of the patterned paper for piecing on this one- the heart features the back side, with some soft Distress edging to make it pop. Her skin & hair were simple colored with Watercolor pencil crayons. I would not call them simple cards, they are delightful and charming, but never simple :) Thank you for sharing your talent with us. Wow! Both absolutely beautiful cards! Both of your cards are so pretty! Really love that mug! Beautiful cards. Awesome images and colors. 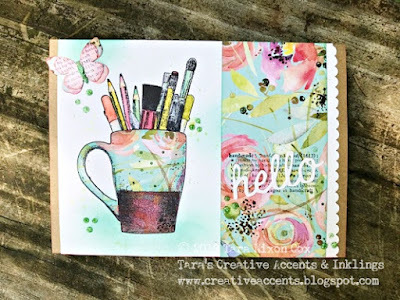 Love the paper that you used. Love the little butterfly. Such a stunning creation, and SO much fun. I love everything about this. These are both so beautiful! Great images... beautiful coloring... love them both! Both are absolutely so pretty! Oh my!! I love this water color paper!! I love the mug filled with pencils. I remember doing that myself with some older mugs for a method of storage. Awesome cards! I love so much the stunning pattern papers!!! Your mug is adorable! So I was browsing on Pinterest a bit ago, as I often do when I'm looking for inspiration, and I came across a pin of my card set that had been featured on the Ranger blog. I was pretty surprised to see the number of times it has been pinned... 3.3k!!! yikes- I'm totally flattered, but kinda bummed too since the tutorial is no longer up on Ranger's website for some reason. So, I'm sharing it with you again here today- perhaps if you see it with a link to Ranger on Pinterest sometime, you'll share this new link! I used a simple torn paper masking technique to create stripes of blended color. 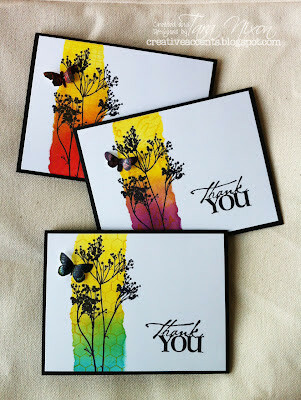 You can see from the card samples some colors that pair together nicely, I like using yellow as combines with so many colors beautifully! 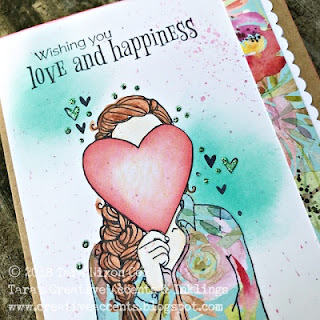 To start, pre-cut a white layer of cardstock and tape torn copy paper over it onto your craft sheet, leaving a space for your ink to be applied. 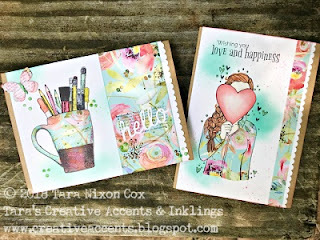 I love how cheery this card set is with a splash of yellow on each card... makes it perfect for our August Challenge over at the Seriously Creative Challenge blog: Summer Sunshine! I hope you'll join us in creating a summer inspired project that features the colour yellow! 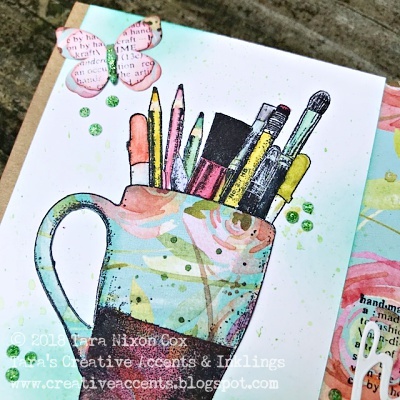 Before I go, I have to share another card you may have seen before- it uses the same technique, with the Summer Distress Ink set! On Saturday I had the fun of teaching my Mixed Media Serendipity Notebook & Card Class at Betty's :) My mom, dad & sister are here visiting from BC and Mom joined in the fun at the class! The group had a great time with paint and ink and texture and shine... and turned out some beautiful projects! I'll be scheduling this one again sometime, so if you missed it be sure to let either me or the girls at Betty's know & we'll make sure you can make it next time!